I love to hear the soothing sound of falling rain. It is not surprising that rain shower heads are becoming more popular! You can bring the relaxing sound of rainfall into your own bathroom at home. A rain shower head will convert your shower experience at home into a spa-like luxury. If you are interested in a new shower head for your bathroom, consider the features of a rain shower head. These products not only provide great water flow and pressure, but they also have an added benefit of mimicking the soothing sensation of falling rain. 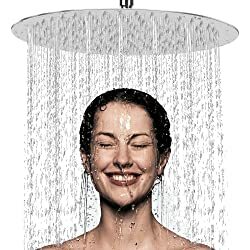 We’ve provided reviews of our favorite rain shower heads, so look at these products and see if any appeal to your needs! This luxury high pressure rain shower head from SparkPod will change the way you feel about taking a shower! The high flow chrome shower head comes with 90 powered anti-clogging silicone jets which remove hard water deposits such as lime scale. These self-cleaning nozzles will let you feel the full force of the luxurious rain-like water flow. 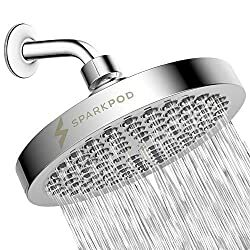 The SparkPod shower head will connect to any standard shower arm within just a few minutes. It has a hassle-free removable water restrictor for a high-end spa-like experience, or you can leave the water restrictor in place to conserve water. You can try this rain shower head risk-free with the SparkPod 30-day money-back guarantee and 1-year free replacement policy. 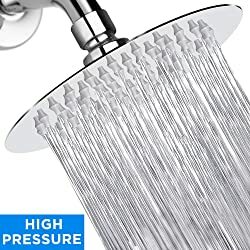 This shower head is a great product for the money. Turn your bathroom shower into an upscale spa with this high pressure shower head. This product will not disappoint you! The MeSun rain shower head comes with an 11-inch solid brass adjustable extension shower arm to give you the ultimate rain shower experience. This gives you flexibility to place the shower head further away from the wall to give you a true rainfall shower. The 12-inch square shower head gives you wide coverage for the gently falling water. This shower head uses a combination of ultra-thin and air-in technology for strong and high pressure water delivery. It works with both low pressure and high pressure water systems and offers consistent powerful water flow. It has a water flow rate of 2.5 GPM (gallons per minute) and can help save water through consistent water delivery. You do not need any tools to install this shower head. SImply remove your existing shower head and install this new shower head within minutes. MeSun offers a 5-year warranty on this shower head making it a risk-free choice for you in rain shower heads! This shower head from WantBa offers consistent powerful water spray even for low water pressure systems. The 6-inch shower head has 57 jets and the entire nozzle head can be removed so you can clean the jets and remove any debris or buildup. There is a metal swivel ball just above the shower head which allows you to adjust the shower head angle to suit your needs. The removable water flow regulator allows you to get a spa-like performance right from your own bathroom. The 2.5 GPM water flow rate will deliver high performance water delivery every time. You can install this shower head in minutes without any tools. It fits standard U.S. plumbing connections and requires a ½-inch female connection. This is a stylish, round ultra-slim shower head that is 6-inches in diameter and only 0.08-inches thick! NearMoon makes this shower head of high quality 100% solid stainless steel with a chrome finish. It is durable and rust-resistant to give you long performance. To prevent leaking, NearMoon uses the best soft rubber gasket for this shower head. The shower head has 60 self-cleaning silicone nozzles to help eliminate mineral deposits from hard water. This rainfall shower head is easy to install and has a swivel ball to provide the most flexibility in positioning the shower head. This shower head is a great solution for small shower spaces. An extra filter gasket is provided for replacement after long use. NearMoon offers a 30-day money-back guarantee and a 2-year product warranty. The sleek, shiny chrome finish of this shower head will enhance any bathroom decor. The ultra-thin design will give your bathroom a spa-like upgrade everyone will envy! This innovative shower head features 4 different adjustable water modes and a 2-way water diverter. This allows you to select from multiple water flow options when taking a shower. 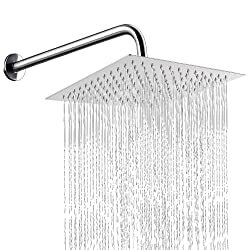 This rainfall shower head has 118 high-efficiency nozzles and 6 high-powered jets. The wand has 60 nozzles and a waterfall outlet which provides a single stream of solid water. The overhead fixture is adjustable to multiple angles, and the wand includes a 5-inch highly flexible stainless steel hose. The shower head and wand are plastic with a shiny chrome finish to give your bathroom shower a spa-like appearance. 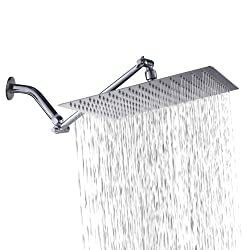 There is no shower arm included with this product, but it is designed to fit the standard ½-inch connections. AKDY provides a 1-year warranty on this product which gives you a risk-free reason for choosing this for your bathroom renovation or new construction project! This shower head combination product from AquaDance features a 7-inch chrome high-power shower head. 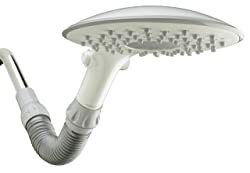 It includes an additional 4-inch face shower head that can be used as an overhead fixture or as a handheld shower. Both shower heads have a click lever dial to make adjustments to the water spray settings. The patented 3-way water diverter allows you to turn the switch and direct water flow between the two shower heads. The angle-adjustable overhead bracket lets you point each shower head where you want it for the best hands-free operation. It includes an extra-flexible 5-foot stainless steel hose with brass connection nuts for long-term durability. Both shower heads include rub-clean jets for easy cleaning and preventing lime buildup. This shower head combination product installs without tools in minutes and you do not even need to hire a plumber! AquaDance offers a hassle-free limited lifetime warranty on this product. This high flow shower head delivers a maximum water flow rate of 3.5 GPM. The pressure boosting shower head uses air-injection technology to amplify the air and water mix delivering a powerful, even water spray. The shower head has 5 adjustable settings for you to choose the type of water spray to use during your shower. The shower head is made of high quality ABS (acrylonitrile butadiene styrene) material with a solid brass ball joint. The shower head can swivel to various angles based on your individual shower preferences. This rain shower head installs in minutes without the need for any tools. The water flow restrictor can be removed in low water pressure systems to deliver an even higher pressure water flow. JOYSTAR offers a 5-year warranty for this shower head with no questions asked. This shower head is a risk-free option for your bathroom upgrade project. You will fall in love with the large 12-inch diameter size of this rain shower head. 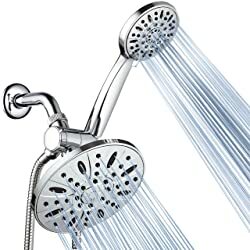 When you stand directly beneath the shower head, you immediately feel the water washing away all the stress of your day. The sleek design of this shower head sets it apart from all other products. It is ultra-thin at only 0.08-inches and the ultra-slim and air-in technology leads to a strong, consistent water flow. The 100% stainless steel construction of this shower head gives you confidence it will last a long time. It is easy to install and works with all standard sized shower arms. You can install this shower head using a wall-mounted or ceiling-mounted shower arm. 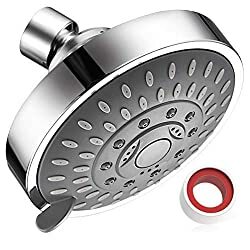 The swivel ball connector lets you angle the shower head to best suit your showering needs. This sleek, shiny 12-inch chrome shower head will fit in with any bathroom decor. When you install this shower head, it will immediately give your shower a spa-like transformation you will not regret! 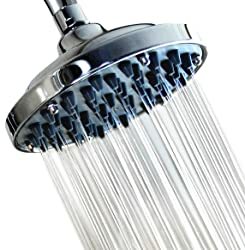 This 12-inch shower head from NearMoon solves many of the problems experienced with other large shower heads. The weight of a large shower head can be a strain on a shower arm or shower arm extension if the arm is not strong enough. 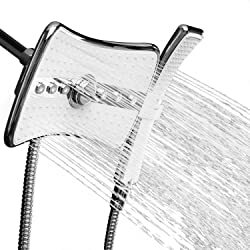 The 15-inch stainless steel extension arm included with this product is strong enough to support the full weight of the 12-inch shower head! 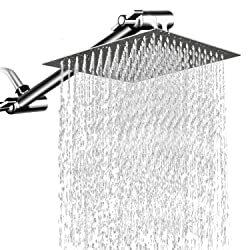 The shower head includes 153 nozzles to give you the maximum in high flow overhead water spray. The swivel ball connector allows you to adjust the angle of the shower head based on your individual needs. The 15-inch extension arm lets you position this shower head directly above you to give you the ultimate rainfall shower effect. NearMoon is so confident in this product they offer a 2-year warranty on their shower head. If you want to experience a spa-like rainfall shower in your own home, consider this amazing product from NearMoon. The rain effect of this shower will amaze you with its powerful water flow! This is an innovative shower head with a 12-inch flexible shower neck which allows you to position the shower head wherever you want it. You can adjust both the height and the angle with little effort. The oversized shower face gives you full rain-like water spray coverage and has a PowerSpray feature for quick rinsing. The flexible neck is a great feature for tall individuals. You can adjust the height of the shower head instead of adjusting the angle. This allows you to still stand beneath the shower head instead of in front of it. The flexible hose is not as fragile as it may appear, so do not be afraid to pull it firmly to make the proper adjustments you need. The anti-clog nozzles allow you to dislodge any mineral buildup by simply rubbing the nozzles to remove any debris. Waterpik offers an amazing limited lifetime warranty on this shower head product. If you have tall people in your family, consider this Waterpik product with the flexible neck technology as a solution for your bathroom upgrade! This is a beautiful brushed nickel shower head from ShowerMaxx. The 6-inch shower head face has 90 precision engineered high pressure jets for a soothing spa-like rain shower experience. The BPA-free and eco-friendly nozzles are anti-clogging and self-cleaning. The adjustable ball joint allows you to move the shower head to the angle that works best for your shower. The shower head has a 2.5 GPM water flow rate to deliver a high pressure shower experience. You can remove the water flow restrictor for an even more powerful shower. You can easily install this shower head yourself without hiring a plumber. The step-by-step installation instructions will guide you through the process. Customer service is available if you have any questions with the installation. ShowerMaxx provides a Peace-of-Mind lifetime warranty on this product. You can buy this shower head and have confidence that any issues will be resolved. This Salari polished chrome shower head will be a sleek addition to your bathroom decor. The 12-inch square stainless steel shower head gives you a durable shower head without any fragile plastic parts. There are 96 nozzles to deliver high pressure rain-like water for your shower experience. This product comes with a solid brass 11-inch wall-mounted adjustable extension arm. This gives you the flexibility to extend this 12-inch square shower head directly overhead for the ultimate in rainfall showers. This shower head has an ultra-thin design at only 2mm thick and the sleek polished chrome finish will give your bathroom a spa-like appearance. Salari offers a lifetime warranty for product repairs. When searching for a rain shower head, there are a few features you should take into consideration. To get the best rainfall coverage, you want to get a shower head that is at least 8-inches or 10-inches in diameter. 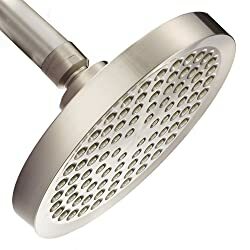 Anything smaller than 8-inches will not deliver a broad enough water coverage and you may end up frustrated with the shower head performance. Anything larger than 10-inches is considered a bonus and will give you even greater coverage than you probably need! For a rain shower head to be effective, you need to stand directly beneath the water flow. If your shower head is a wall-mount fixture, then you need to have a shower arm extension that will position the shower head above you. If your shower head is a ceiling-mount fixture, then you can position the shower head above you so you get the maximum effect of the rainfall water spray. Rain shower heads have either a round, a square or a rectangular shape. The shape of the shower head is a personal choice and really depends on the type of look you are going for in your shower upgrade. There are many shower head finishes available with the most popular finish being chrome. You should pick the finish that appeals to you the most. It is not critical for the finish to match all the other fixtures in your bathroom. Consider being bold and select a finish that will set off the shower head and distinguish it from everything else in your bathroom. If your other fixtures are chrome why not consider an oil rubbed bronze shower head? You might be surprised at how much it accentuates your bathroom decor. A rain shower head will turn your mundane bathroom into a spa-like getaway. There are many choices available and you can choose from any shape and finish that will fit best in your bathroom. Consider the product reviews we have provided and the guidelines for choosing the best rain shower head. You will not regret switching to a rain shower head!